Knowing how to build a wood stove could be vital if you have experienced a catastrophic event such as a complete economic breakdown or an EMP attack. You may be left to your own devices when it comes to heating your home. This is especially important if you live in an area where cold winters can be an issue. If you’re going to build a wood-burning stove the first thing you have to do is gather the appropriate materials. Here is what you will need to build a rocket stove which is a type of wood stove much smaller than one you would build with a 30 or 55 gallon drum. The first step in how to build a wood stove is making the foundation using 2x4’s to fashion an 18” by 18” by 4” wood frame. Now pour in your premixed cement. If you live in very cold weather you will want your foundation to be deeper than 4” to avoid the frost. A depth of 6-8 inches would be fine. Now you will need to build a brick cube leaving a hole in the bottom for the stove pipe. Don’t worry if your masonry isn’t perfect. It will still work. The next step to build a wood stove is to put the stovepipe together. Fix your elbow to the longer pipe and size it so the top of your pipe is just below your grill. Now you’ve got an L shaped stovepipe that runs from just below your grill to the hole in the bottom of your brick cube. Now you will need to pour ash into the brick cube so that the entire cube is filled up. There shouldn’t be any gaps. The ash should come right up against your piping. The ash is your insulation between the stovepipe and the sides of the brick cube. This increases the efficiency of your stove. Do not use soil or sand. The last thing you need to do is to take a tin can and slide it down the sides and flatten it out. This makes a shelf that you can insert into the pipe at the bottom of your stove. You pile twigs and kindling on the shelf. Under your shelf you put your newspapers which you will be lighting on fire. As your stove burns keep pushing the twigs and kindling over the edge to keep your fire going. Now you know how to build a wood stove. Of course due to the use of cement and bricks your stove is going to be too heavy to be practical if you are thinking of moving it. 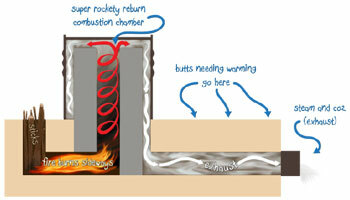 You can however build a portable rocket stove using a number 10 can and four smaller ones. The amount you can cook on one of these very small stoves is limited, but it is still useful in a pinch. In times of crisis you may not have access to cement or bricks but you can probably find the cans you need for a portable rocket stove. Just Google rocket stoves on the internet and you’ll find step by step instructions on how to build these smaller stoves. The time to build your stove is not after the bombs start falling. Be prepared. Build now what you will need when your world falls apart around you. Today you can easily get bricks, cement, piping, and a grill; tomorrow you may not be able to.